A few years shy of my fiftieth birthday, I went on a road trip with one of my best friends from high school. We’d taken some version of this trip many times during our teens and twenties, but as we started raising young children, we didn’t have much time for getaways. But on this occasion, our kids were old enough to fend for themselves, and we hit the road with same excitement and silliness that characterized all of our youthful adventures. We spent the next few hours talking, laughing, listening to music, singing, and generally feeling like carefree teenagers again. At some point along the way, we had to stop for gas and snacks and pulled into a Citgo. We went inside the store still laughing, singing, and acting silly, and as we walked back out to the car, I caught a glimpse of a middle-aged woman in the mirrored glass windows of the store. It only took a nanosecond to realize the woman was me. For just that moment, I was perceiving myself as an outsider, and the judgment came down hard and fast. Even though I was feeling young and beautiful and carefree on the inside, my own distorted self-perceptions around aging and appearance quickly brought me back to the reality of who I was on the outside and how I was supposed to behave. Of course, this glimpse of myself at the Citgo wasn’t my first reminder that my once youthful attractiveness was fading. I’d been carefully monitoring every new wrinkle and added pound for years. I’d stared in the mirror many times pulling the skin back on my face to see how many years a facelift might remove. But the Citgo event was the first time I realized the subtle toll my self-perceptions were taking on my psyche and self-confidence. Somewhere inside of me I believed middle-aged women didn’t sing and laugh and act silly. That was reserved for the young and beautiful. In our youth and beauty-obsessed culture, every time we open a magazine, turn on the TV, or drive past a billboard, we see how far our personal reality is from the standard perpetuated by the media. These messages were obviously entrenched in me, but I didn’t truly wake up to it until I applied the harsh judgment to myself. Was I really going to allow these messages to keep me from feeling beautiful and carefree? And more importantly, as my physical appearance continues to change, is my self-worth going to diminish more and more over time because society tells me I’m no longer relevant? These images and messages don’t just affect those pushing forty or beyond. Young women in today’s culture see more images of exceptionally beautiful women in one day than our mothers saw throughout their entire teenage years. It’s no wonder that eight out of ten women are dissatisfied with their appearance. And it’s not just a female issue. A survey from the Centre of Appearance Research at the University of West England reveals that men also have high levels of anxiety about their bodies with some resorting to compulsive exercise, strict diets, laxatives or making themselves sick in an attempt to lose weight or get toned. Simply put, we are obsessed with beauty and appearance. And it’s not just an issue of aging. 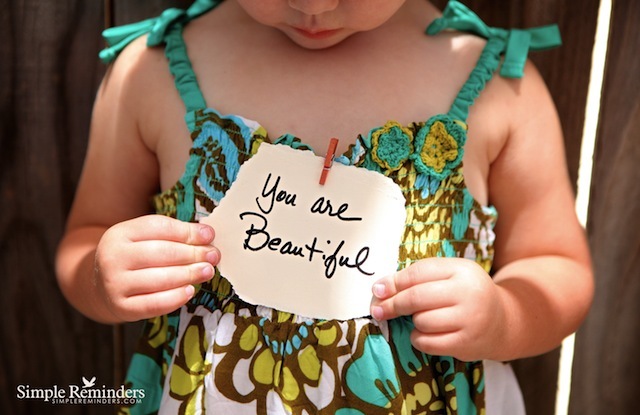 Nearly all of us are impacted by feelings of unworthiness related to our looks. The levels of attractiveness promoted by the media are achievable by less than 2 percent of the population. The beauty elite are dictating the standards for the masses. But what if we started a beauty revolution? What if we pushed back against the brainwashing of Hollywood and the media and proclaimed a new definition of beauty? What if true beauty were defined by who we are rather than how we look? My own internal revolution began one summer day in the parking lot of a Citgo somewhere in south Alabama. I was feeling young and happy, and I almost allowed my self-judgment to steal the joy from the day. But truthfully, I was beautiful that day. Were I to look back at the reflection of the woman in the Citgo window, I’d see someone brimming with aliveness and fun. And that’s who I really am, in spite of my changing appearance. What if our true beauty rested in simply being who we are, with the face and body we own, and joyfully embracing that every day? What if it was okay to have flaws, to be less-than-perfect—not only okay but actually preferred and even celebrated? When the focus is removed from our faces and bodies and how we don’t measure up to impossible standards, then we’re emotionally and psychologically free to express and explore who we are authentically, our true selves and our true beauty. Of course, from an individual perspective, this true beauty revolution is easier said than internalized. It is still a work in progress for me. We spend years focusing on all of our physical flaws, and it takes a real mind shift to reject all of the cultural messages and embrace that beauty is expressed from the inside out. If you accept the premise that “true beauty” is much more than having a model-perfect appearance, there are ways to begin retraining your thinking and igniting your own internal beauty revolution. Here are some thoughts that helped me release self-judgment and embrace my true beauty . . .
Take a good look at the people in your life that you love—your spouse, your children, your parents, your siblings, and your close friends. It’s likely the majority of these loved ones aren’t model beautiful, and yet, are they not beautiful to you? The familiar faces, the twinkling smiles, the kind gestures, the comforting bodies and arms that embrace you. Each person has an inner beauty, a unique character and light that makes them who they are. You see them as truly beautiful—and these people view you the same way. Remind yourself every day that the people who truly count recognize your beauty and try to validate their good opinion by believing it yourself. This was a huge shift for me that has led to self-acceptance. Yes, there are some elements of our faces and bodies we simply cannot change. Rather than resisting and struggling against these things, relax into them and accept them with love. Struggle and resistance do nothing but push us further away from recognizing our true beauty. Acknowledge and accept those parts of your appearance you have grown to hate. View them as children who long for and deserve your love and acceptance. As I’ve gotten older, I realize how much more beautiful I feel when I take care of my body. Sometimes we become so disconnected from our true beauty that we neglect and mistreat our bodies, further entrenching us in low self-confidence. But as you begin to treat your body more lovingly, you will feel better mentally and physically, affording the clarity to recognize your true inner and outer beauty. Feed your body with whole, nutritious foods. Move your body through exercise every day for at least twenty to thirty minutes. Acknowledge the bad habits that are harming your body, and work to release those habits over time. This is an exercise I love. For a moment, mentally step outside of yourself and pretend you are your most loving, best friend. From the perspective of this friend, write down all of the personality traits, skills, behaviors, and qualities that you think are beautiful. Don’t allow your negative voice to intrude on this exercise. Also ask this friend to write down the physical traits that are beautiful—your eyes, your hands, the curve of your neck. Remember, you have a choice about where you want to place your mental focus. Keep this list nearby whenever you find yourself focusing on your flaws. Read the list and remember you have more positive qualities than negative—so choose to focus on the positive. As I’ve grown older, I’ve consciously redirected my focus away from dwelling on my appearance. Yes, I still do what I can to look attractive and presentable. I exercise and eat a healthy diet. But I try not to obsess about the changes my face and body are undergoing. Instead, I focus on my passions for helping others through personal development, writing, and teaching courses. I recognize that my true beauty shines from expressing my authentic self, from the joy I experience in daily life, and from my interactions with loving friends and family. For me, true beauty comes from living fully, being who I am, and experiencing the beauty all around me. Allow the light in your heart to shine for yourself and others, and in so doing, your entire being will glow with a fire of beauty. You will be a beacon of attractiveness to everyone you encounter. Barrie Davenport is a certified personal coach, author, and founder of Live Bold and Bloom. Please take her Free Self-Confidence Test to find out your personal confidence score.